Build this easy dollhouse or dolls house style bookcase with a traditional front opening, using a single sheet of plywood and some standard wood trim. It is designed to fit in with standard sized bookcases placed against a wall. There are also instructions for building custom doors and windows. The case can hold individual roomboxes, or it can be built with fixed shelve and partitions as a standard dollhouse. Adjust the trim and details on the front opening doors to suit your own style, or follow the suggestions for a traditional finish. Photo ©2008 Lesley Shepherd, Licensed to About.com Inc.
Free plans and instructions to build a traditional styled dual purpose dollhouse or baby house in 1:12 scale shown here with plywood and bookboard roomboxes. As designed, the dollhouse is the depth of a standard bookcase and will accept the basic roombox sizes listed below if you want to build it as a bookcase and insert individual ​roomboxes on the shelves. The case can be used to store individual roomboxes until you have a full dollhouse collection, or it can be finished on the interior as a stand-alone dollhouse with fixed floors and partitions by adding slots or moldings to hold the walls in place on the shelves. If the case is set up to hold roomboxes, the adjustable shelves allow it to be used as a bookcase should the owner's interests change. Photo copyright 2008 Lesley Shepherd, Licensed to About.com Inc. Instructions for how to plan and fit your choice of windows and doors into the front opening doors of the basic dolls house case outlined above. If you build the house according to the plan measurements, one sheet of 5ftx 5 ft Baltic birch plywood will complete the entire house of case, doors, and shelves. Learn how ​to add quoin and cornice trim made from standard wood moldings to the front of a basic dollhouse for a traditional townhouse house style. These instructions include a plan to make a half glass dolls house doors with a divided base suitable for bevel edged panels. You can use the instructions to build a range of dolls house scale doors, with various panel designs and with and without 'glass'. These instructions show you how to make dolls house windows from strip wood or card, or from special sash moulding for 1:12 scale windows. The techniques can be used for many miniature scales, and show you how to make opening casement windows, fixed windows, and windows with muntins. 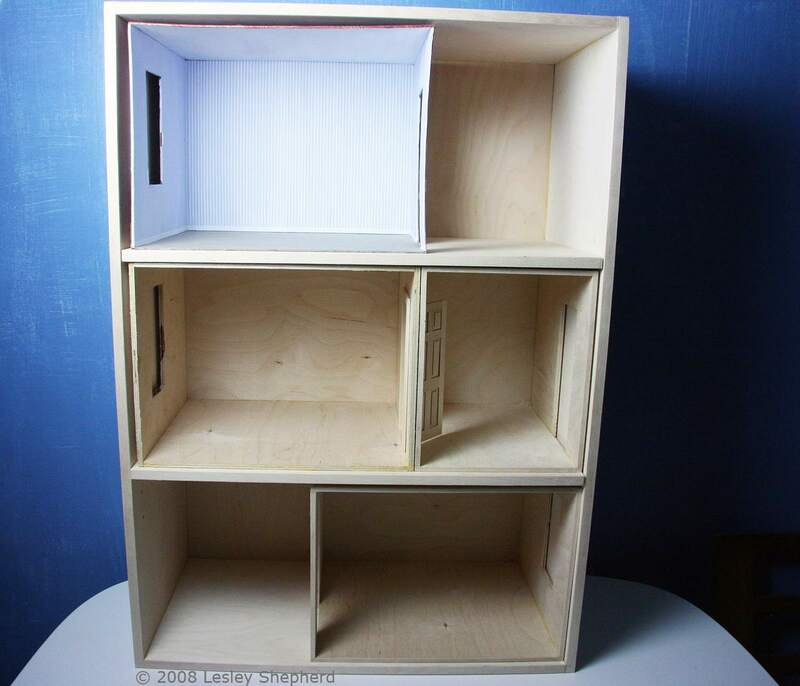 These plywood roomboxes can be connected to make a dollhouse, or used as single room displays. They are designed to fit in a standard bookcase and can be given glass roofs or framed glass fronts to protect the contents from dust. The townhouse dollhouse shown above will hold three standard roomboxes and three half size roomboxes to create a townhouse collection of entrance hall, living room, dining room, bedroom, bathroom, and staircase. The finished exterior of a dolls house roombox made from Davey board is covered with decorative paper for strength. Photo ©2008 Lesley Shepherd, Licensed to About.com Inc.
Photo ©2007 Lesley Shepherd, Licensed to About.com Inc.
What do you need to know before you start wiring a dolls house? Will it be easier to use round or tape wire?